Donors make planned gifts to charities for many different reasons, e.g, to: give something back; leave a legacy for future generations; support important social causes; and ensure that the programs and services of a favorite charity continue to benefit others. In turn, the advantages of making a planned gift may include: reduced current taxable income; elimination of capital gains tax; increased retirement income; and direct or indirect control over how charitable funds are spent, to name a few of the benefits to the donor. Besides donating gifts of cash or securities, you can achieve your personal philanthropic goals for supporting The Arc of Somerset County through planned giving. With proper planning, charitable giving can offer many benefits the donor and recipient. Consult your attorney or tax advisor if you wish to donate using any of the options described below. Beneficiary designations are an easy way to make a legacy gift to The Arc, without affecting your cash flow during your lifetime. Simply name The Arc of Somerset County as a full or partial beneficiary. Common designation options include: bequests; insurance policies; and retirement plans, to name a few. Specific bequest - Determine a specific dollar amount or asset that you wish to leave to The Arc Somerset County. Residual bequest - After first taking care of loved ones, name The Arc of Somerset County to receive a percentage or all of your residuary estate. Contingency bequest - Leave a portion of your estate to The Arc of Somerset County in the event that your named beneficiary does not survive you. You can give needed support for The Arc of Somerset County by simply including the following wording in your will: "I give, devise and bequeath to The Arc of Somerset County (insert donated amount here) to be used to support the mission of The Arc of Somerset County." A bequest can be a specific dollar amount, a specific piece of property, a percentage of an estate or all or part of the residue of an estate. Bequests are free of estate tax, and can substantially reduce the amount of your assets claimed by the government. We encourage you to contact your attorney when drafting or amending your will. Donors can make a gift of life insurance by designating The Arc of Somerset County as the owner or beneficiary of a policy. When The Arc is named the owner of a paid-up policy or a policy with internal cash value on which future payments are owed, you may claim a charitable deduction. Contact your insurance company or a professional appraiser to determine the deduction amount. Donors can also make outright gifts to The Arc to pay future premiums on a policy to keep it in force, which may result in additional charitable deductions. As the cost of life insurance is only "pennies per dollar" of coverage, a gift of insurance becomes a practical way for an individual to make a sizeable donation to one's favorite charity at a modest cost. Retirement assets (IRA, 401(K), Keough, etc.) paid to your heirs may be taxed up to 80%, but they are tax-free to a charity. In 2008 and 2009, donors could direct a tax-free, outright disbursement from their IRA to The Arc of Somerset County, which also counted toward the donor's minimum required distribution if s/he were age 70 1/2 or older. Contact your plan administrator/advisor if you wish to make a donation to The Arc from your retirement assets. With a life income plan, you can provide yourself and loved ones with income for life, as well as income tax savings. Common life income plans include: Gift Annuities (fixed income), Deferred payment gift annuities (fixed income), Charitable remainder annuity trust (fixed income) Pooled income fund (variable income), and Charitable remainder unitrust (variable income) and others. All of these plans provide favorable capital gains treatment if funded with appreciated assets. You may create a charitable remainder trust for The Arc of Somerset County by placing assets into a trust that will provide you a tax deduction and generate income today. The remainder of the trust passes to The Arc of Somerset County as a legacy gift. A charitable lead trust works in the opposite way. You may choose put assets into a trust and then allow income generated from it to go to The Arc of Somerset County for a specified period, while retaining the principal. When the trust terminates, the assets are returned to you. 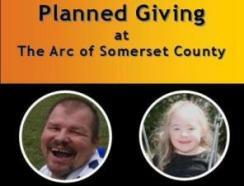 You may receive tax benefits by donating a personal residence to the Arc of Somerset County, while continuing to live in it. A life estate gift combined with a life income gift, may result in the Arc of Somerset County providing you with income for life as well. There are many different ways to achieve your philanthropic goals, while safe-guarding your assets, caring for loved ones and creating a life legacy that supports your favorite charity. The Arc of Somerset County staff will be happy to work you and your legal and financial advisors to develop gift planning to meet your needs.